ACE Rubber Products, Inc. specializes in providing high performance solutions for rubber to metal bonding applications. We apply our engineering and materials expertise to determine the right combination of natural or synthetic rubber, substrate, and bonding agent to meet the strength and durability requirements of any unique or demanding application. Our bonding process vulcanizes rubber materials while mechanically or chemically attaching them to a variety of substrates including steel, stainless steel, brass, aluminum, copper, and Inconel. Choices of elastomers are extensive and matched to application requirements. Bonding agents are selected to complement the physical characteristics of the rubber when cured and maintain the optimal integrity of the bond over an extended service life. Able to manufacture parts with dimensions of up to 40" in diameter with tolerances that meet or exceed RMA standards, we are capable of manufacturing quantities ranging from prototype to large volume production. Our flexible operations allow us to meet the tightest delivery schedules while adhering to all relevant industry standards. 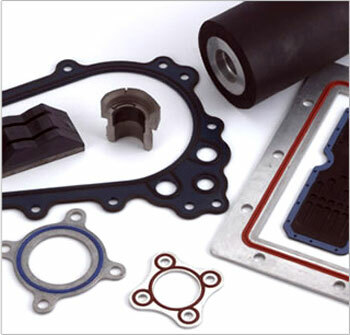 We have 25+ years of experience in rubber to metal bonding of components in the aerospace, electronics and oil field industries, and our consistent high quality products and reliable service has earned us many loyal customers. To learn more about our custom rubber to metal bonding services, contact us today.